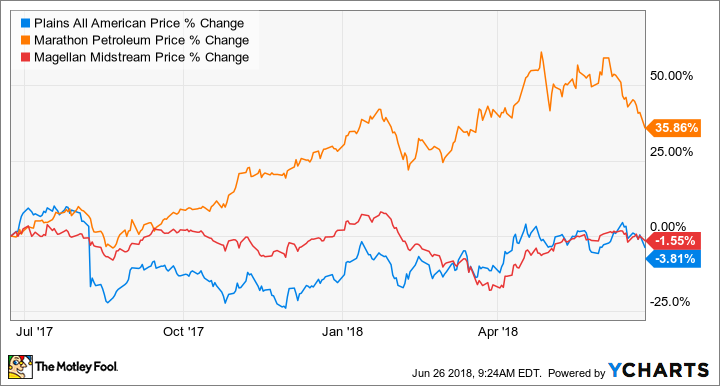 Here's why you should take a look at Plains All American Pipeline, Marathon Petroleum, and Magellan Midstream Partners. Those who have considered investing in the oil industry lately will likely find a fascinating story. Many companies are still trading at valuations we saw a couple years ago, when oil prices were below $50 a barrel, but the looming threat of alternative energy has some people wondering how much longer oil's investment window will last. Fortunately for those looking at these attractive valuations, oil's end-of-days scenario is likely a ways down the road. So, we asked three Fool.com contributors to highlight a stock they see in the oil industry right now that looks attractive. Here's why they picked Plains All American Pipeline (NYSE:PAA), Marathon Petroleum (NYSE:MPC), and Magellan Midstream Partners (NYSE:MMP). Matt DiLallo (Plains All American Pipeline): Oil pipeline giant Plains All American Pipeline is about to reach two major inflection points. First, cash flow is on pace to start growing again this year, which will reverse a multiyear decline. In fact, the company expects to deliver double-digit annual growth for at least the next two years thanks to the expansion projects it has lined up. Driving that growth is the company's prime position in the Permian Basin, where it's rapidly expanding its pipeline network. Plains All American Pipeline currently has nearly $2 billion of expansion projects under construction, with 80% of that spending earmarked for the Permian. With such a large strategic footprint in the region, the company should be able to capture additional growth prospects in the future, which positions it to continue expanding cash flow. Too much pessimism about a pending merger? Tyler Crowe (Marathon Petroleum): There are always going to be a lot of questions whenever a company makes a monumental acquisition like Marathon Petroleum's pending purchase of Andeavor. The $23 billion deal will make Marathon the largest oil refining and marketing company, but there are, of course, questions about integrating the business and wringing out the $1 billion in operational and revenue synergies that management says it can achieve. Then, there is the fear that the company overpaid. I can't put those doubts to rest, but one thing Marathon Petroleum's management has shown over the past few years is the ability to run an efficient refining operation that churns out lots of cash. Taking over Andeavor and its large refining footprint in the Permian Basin and on the West Coast will give Marathon a lot more optionality when sourcing crude oil and distributing fuel. One thing that will be working in Marathon's favor during this integration period is that it is an incredibly lucrative time to be in the refining business. Today, the price of domestic crude (West Texas Intermediate) sells at a steep discount to the international benchmark price (Brent). Even better, crude oil coming down from Canada (Western Canadian Select) sells at a significant discount to WTI, so companies with the ability to handle these two particular types of crude stand to benefit immensely since they will be able to source these heavily discounted feedstocks. Having ample cash flow will allow Marathon to invest in the integration rather easily while continuing its trend of handsomely rewarding investors with dividends and share repurchases. There are several things working in Marathon's favor right now, yet the stock has a price-to-earnings ratio of only 10, which seems more than reasonable even if the refining business isn't as great as it has been over the past few quarters. Reuben Gregg Brewer (Magellan Midstream Partners, LP): Magellan is a large and diversified midstream partnership. While it doesn't produce oil, it is a vital cog in the oil industry, helping to move the energy source from where it is produced to where it eventually gets used. The partnership is among the most financially conservative players in the midstream space. Its debt-to-EBITDA ratio is at the low end of the industry and its distribution coverage is currently being targeted at a solid 1.2 times. Add in a business that is over 85% fee-based and the partnership's generous 5.5% yield looks easily sustainable. That's the core reason why income investors should like Magellan right now -- a large and safe distribution. A little history adds even more allure here. 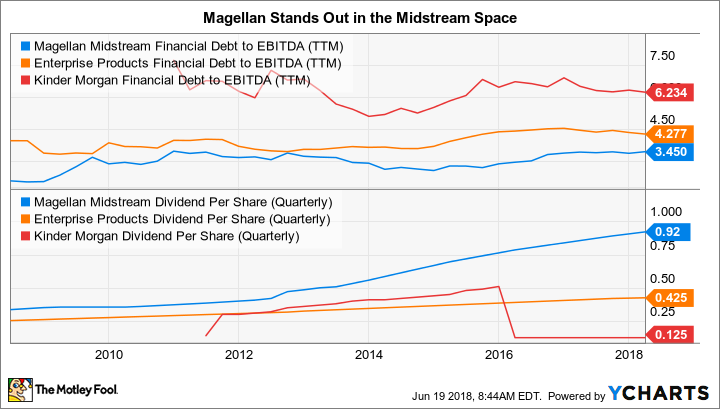 Magellan has increased its distribution every quarter since its IPO -- including right through the deep energy downturn that started in mid-2014. Magellan tends to trade at a premium to its peers, but remains around 20% off of the highs it reached when oil prices were peaking. With oil coursing through its midstream veins, Magellan is a name that conservative income investors should be looking at very closely today.